Texas is known for its outstanding cuisine as its friendly residents. 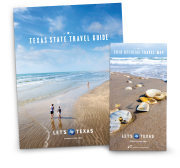 Whether visitors are looking for award-winning barbecue, authentic Tex-Mex, delectable hand-cut steaks, freshly caught seafood from the Gulf Coast or a contemporary experience to tickle the palate, you cannot go wrong with the diverse and deeply rooted dishes Texas has to offer. Discover world-class cuisine at first-class restaurants across the state, making for the ultimate dining experience! Texas continues to gain national attention with its cutting edge contemporary cuisine, and has recently become known as a premier gastronomic destination producing some of the most innovative culinary artisans in the industry. Ambitious chefs bring impeccably crafted menus and fresh ideas to restaurants in major cities like Houston, Dallas, Fort Worth, Austin and San Antonio. Inspired by local ingredients, as well as the rich and diverse emulsion of cultures prevalent in the state, and coupling these with high quality and culinary artistry, these chefs have helped spotlight Texas’ growing reputation as a vital culinary scene. It is no secret that few people can agree on the “right” way to cook barbecue; however, all Texans agree that it is a culturally iconic staple of their diet and a tradition that they love to share. Unlike other regions of the South where pork is most prevalent, beef is most common to traditional Texas barbecue and has remained so since the Civil War. To understand what makes the Texas’ dish so legendary, hit the Texas Barbecue Trail. Travelers will visit mouth-watering, family owned BBQ joints in Taylor, Elgin, Luling and Lockhart – the “Capital of Texas Barbecue.” Dive right in and wrap your taste buds around juicy brisket, fall- off-the-bone ribs and succulent sausages of all varieties that will leave you craving more. No matter where you go in Texas, you'll find your Tex-Mex fix. Tex-Mex is a hybrid of Spanish, Mexican-Indian and Anglo fare that was originally created by Tejanos when Texas was part of Mexico. From the Rio Grande Valley up into the Panhandle Plains, hungry eaters can find traditional dishes served at local holes-in-the-wall to well established venues serving crispy and soft tacos; enchiladas; nachos with a blend of meat, cheese, and refried beans; and chili con queso as well as grilled chicken and beef fajitas - all served alongside tortilla chips and freshly made tomato salsa. Sea breezes and succulent seafood collide in beach towns along the Gulf Coast. Baked, grilled or fried, Texas seafood will delight all taste buds! An attraction for many, the fresh seafood markets located along the piers on the coast offer visitors the chance to purchase freshly-caught seafood from the Gulf waters, maybe to enjoy that very night or perhaps to take home to family and friends for a truly unique gift. On any given day, the aroma from a pot of simmering chili on the stove is a sure way to get your mouth watering. Proclaimed by the Texas State Legislature as the official “State Dish” in 1977, chili comes in many appealing varieties. A perfectly seasoned blend of chili powder, oregano, paprika, cumin and cayenne pepper, paired with ground beef, tomato puree, garlic and other variations, make this a traditional “go to” dish. Chili maintains its roots in the Deep South dating back to the 1800’s and is still enjoyed by cowboys, cowgirls and modern day city folk alike. For the best chili around, visitors and natives make their way to Terlingua for the International Championship Chili Cook-Off, typically scheduled each November. This long-standing Texas tradition was first held in 1967 as a competition of wit as well as chili, and today the competition still stands strong among others throughout the state. If you’re in the mood for some Cajun food, Texas has that too. Anything from gumbo, boiled crawfish, etouffee, and boudin sausage can be found in Texas. All of these dishes have become a part of the state&apos;s cuisine through the blending of Cajun culture by those who settled in Texas from Louisiana. This influence can be seen across various regions, although Beaumont, Orange, Port Arthur and Houston are among the cities that are home to some of the best Cajun restaurants the state has to offer. One of the newest trends on the Texas culinary scene is the explosion of food trailers offering gourmet tidbits more suited to a five-star restaurant than a meal on wheels. Austin has been one of the undisputed leaders of this new movement, not just in Texas but nationwide. As the trend continues to spread, food trailers are gaining ground in neighboring dynamic cities such as Houston and Fort Worth with creative culinary chefs preparing innovative dishes in new ways. Texas has continued to be recognized for its storied past and it emergence as a culinary powerhouse. Today, the national spotlight shines on, inviting all to try its magnificent cuisine. Find your favorite food and plan a trip for your taste buds.